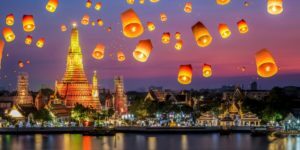 Thailand just waived off its visa on arrival fees for the time period between December 1 and January 31 for travellers from 21 countries, including India. In a move to increase traveller inflow in the country and boost tourism, Thailand’s cabinet recently approved a measure to waive off two months fees paid by visitors for visas on arrival.In the new measure, tourist from 21 countries will not pay the visa fee of 2,000 baht (Rs 4,385) for the time period between December 1 and January 31 for travellers.The countries who can take advantage of this waiver are India, China, Taiwan, Saudi Arabia, Andora, Bulgaria, Bhutan, Cyprus, Ethiopia, Fiji, Kazakhstan, Latvia, Lithuania, Maldives, Malta, Mauritius, Papua New Guinea, Romania, San Marino, Ukraine and Uzbekistan. However, the duration of stay in the country will remain fixed at 15 days.